Call me skinny, but how happy are you that 12 of these identity crisis chocolates round out to about 200 calories? These are delicious - like Pringles without the annoying dehydrated potato dust. Oh my gosh, I'm seriously eating these right now..... YUM! I think I could live off of these.... well, at least a box a day... Where can you buy these in Honolulu, Hawaii. ugh I did the exact same thing! I keep them in the fridge as well and they are a-mazing! Oh for the love of God, how could TJ's do this to us? 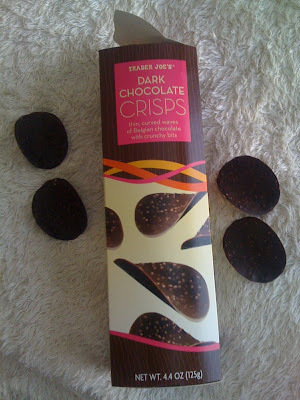 Chocolate is not meant to be eaten like potato chips. Come to think of it, potato chips should not be eaten like potato chips, let alone at all. So maybe... just one more. Unfortunately, we don't have a Trader Joes in Hawaii. You can get it on ebay for $6.99 plus $4.50 shipping to Hawaii. Are they like Pringles, salty? Or are they a "cookie" or simply highly fragile chocolate slices? uhm can i buy this on a local store like target or walmart ?